It could have been us! This was a year when we might have reached the Final of all 3 age categories but somehow the final putts just would not fall in the hole. Roger Cooke (B1952-56) and Jeremy Irwin (SHO1954-58), as defending champions of the Bunny Millard Salver (for players over age 75), reached the Final again. They took the match against Downside to the 18th hole but just missed out on what would have been another famous victory. In the Peter Burles Salver (for players over age 65) we reached the Semi Final of the Plate competition and narrowly lost to Felsted with both matches going to the 18th hole. In fact, all 6 matches went to the 18th apart from one which we won at the 16th hole. 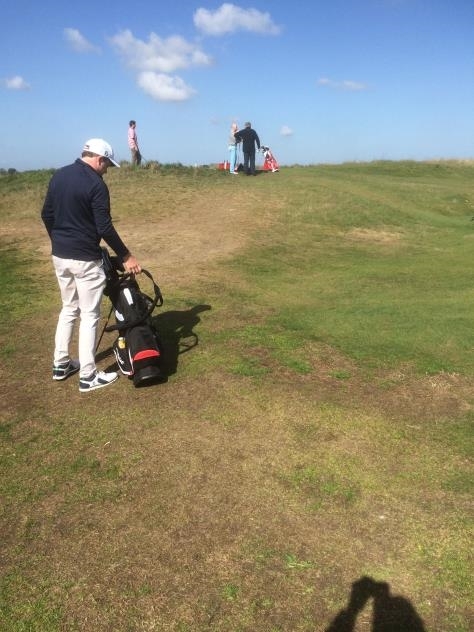 In the Mellin Salver (for players over age 55) we won a memorable 1st Round match against Lancing with Steve Lewis (B1970-75) and Ian Wilson-Soppitt (P1958-61), our President, winning at the 21st hole. We had to face Haileybury in the 2nd Round and although the Yule brothers, John (SHE1966-71) and Paul (SHE1969-74), won their match (after winning in the 1st Round as well), we just couldn’t get the second point we needed. It was a wonderful week and we did really well. My thanks to the players for all their sterling efforts in maintaining and enhancing the reputation of our great School.